Welcome to Italy! Upon your arrival in Florece airport, you will meet an English speaking assistant waiting for welcome you and transfer by private coach to your hotel in Florence Accommodation at Hotel 4*centrally located and free time to explore the city center on your own. A welcome dinner tonight will be served in a typical restaurant within walking distance from your hotel. Overnight in Florence. Breakfast in hotel. And you going to your meeting point Walk through the amazing center of Florence and discover its unique secular heritage and breathtaking beauty with an expert and fun tour guide. 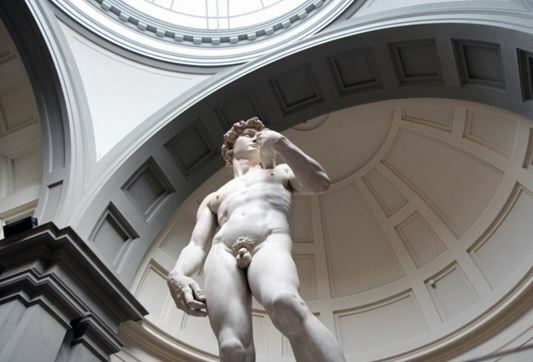 Our tour explores the historic and architectural evolution factors from the Roman foundation through medieval centuries and its Renaissance glorious period up to modern time Florence. Stop for a surprise “tasting”, and learn about the culinary and wine aspects of our unique cuisine. Our guide will take you to some of the most important spots where the greatest minds and artists have stood and been inspired: Piazza della Signoria, the Duomo, the Baptistery, Santa Trinita and Orsanmichele Church, Pontevecchio Bridge, the secret Vasari Corridor and much much more. Breakfast in hotel. And you meeting your meeting point. First step: Little walk to the Central Market, grocery shopping! You will go shopping with the chefs at the central market picking up the ingredients for your lunch. You will meet the butchers, the bakers, and the farmers selling vegetables from their gardens. You will learn how to distinguish the highest quality ingredients and taste local foods & wines! After this fun experience you will reach our home-like professional location and you will start putting your hands on the ingredients to create your own meal, driven by the expert guidance of our Chefs. Breakfast at hotel, and check out from Florence and ready for second part of Tuscany! Where better to experience a romantic and exclusive introduction to Chianti Classico Wine than in its very origins? Let us guide you on an intimate excursion through Tuscany. By minivan you will be comfortably escorted through the outskirts of Florence 2 different wineries located the rolling hills of Chianti region. A sommelier will guide your experience as you taste and learn about the different methods of wine production in two of the oldest and most traditional wineries as well in the afternoon check in to your hotel in Siena center. After your breakfats meeting your guide and enjoy a half day sightseeing to Siena and most caratteristic places.. as Piazza del Campo, Palazzo Comunale, , Basilica di san domenico Siena is a treasure trove of historical, artistic, religious and cultural riches all to be discovered. The best way to do it is on foot, admiring the changes to the town over the centuries and enjoying its spectacular views and the interesting details of its history. ! Before leaving this magical town we won’t miss having a gelato in the best ice cream shop of the area, placed just in the main square. Lunch on your own and in the afternoon visit to San Giminiano. Late afternoon return to the hotel and time at your leasure.